Bobcat Co. introduced its first compact tool carrier in 2002 with its mini track loader line and the MT50. Additional models, including the MT52 (2003), MT55 (2004) and MT85 (2015), were eventually added to the line. When the MT52 was introduced, it featured the industry’s first ride-on platform that could easily be detached for walk-behind operation. 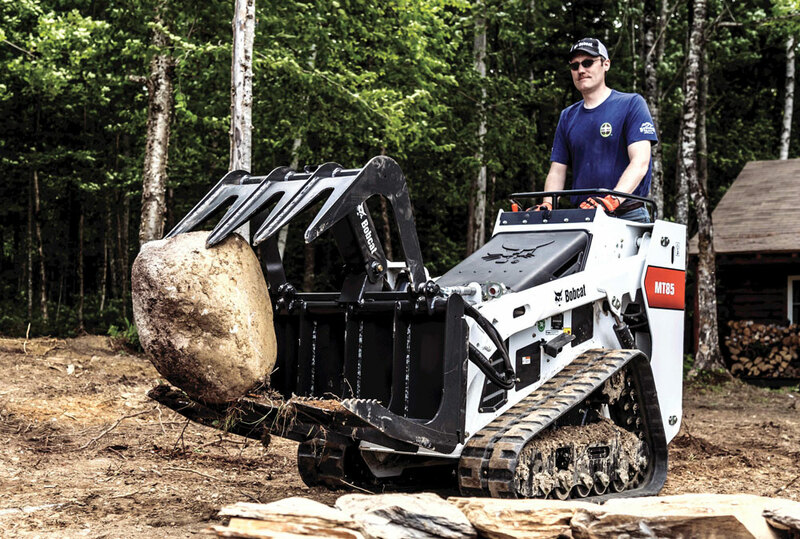 Bobcat mini track loader popularity grew, in part, because the loaders could operate select attachments approved for larger skid steer loaders, using the popular Bob-Tach attachment mounting system, to increase their versatility and improve operator productivity. One of the most obvious benefits of mini track loaders is their ability to travel through tight spaces, such as doorways and fence gates, and work in confined spaces in landscaping, construction and agriculture applications. Bobcat mini track loaders are just 36 in. wide when paired with a bucket, and their compact size makes them easy to load and transport on a trailer from jobsite to jobsite. Today, the Bobcat product line includes the MT55 and the MT85. MT85 mini track loaders provide a 54 percent increase in rated operating capacity and a 14 percent increase in lift height to help customers accomplish more work and replace tasks previously done by hand with wheelbarrows and shovels. The MT85 mini track loader is configured with two ISO joystick controls for enhanced operator comfort and convenience. The ergonomic controls help change travel speed and direction with the flick of a wrist. Bobcat says its mini track loaders have powerful Tier 4-compliant diesel engines and efficient hydraulic systems to deliver fast cycle times, strong breakout forces and excellent pushing abilities. The machine’s frame, lift arms and hydrostatic drive system are designed for a long, dependable service life. With the new common industry interface (CII) for the MT85, owners can utilize attachments they may already own. Popular attachments for mini track loaders include buckets, pallet forks, augers, trenchers, stump grinders and hydraulic breakers. A rubber track undercarriage distributes the loader’s weight, reducing ground pressure and minimizing damage to lawns and other established surfaces. Less ground disturbance means fewer repairs, happier customers and improved profitability. With solid traction in wet, muddy and sandy conditions, the machines can keep crews working when they might otherwise be waiting. Find out more about Bobcat Co. here.